When a person dies – say a member of the family, especially unexpectedly, you would most likely end up with what is known as a Deceased Estate. A Deceased Estate is everything left behind by a person who has passed away, whether it’s documents, property, money or even debt. If a person has already prepared a will, everything he/she left behind would be easily dealt with, as opposed to when the person dies suddenly. If you have been left in charge of a deceased property and it happens to be a lot, you may end up overwhelmed with what you have to deal with. If the deceased person was particularly fond of material things, you would have your work cut out for you as you might get stuck with a whole bunch of things you neither want now need. This is where skip bins can be very useful. Learn about the different benefits of hiring skip bins to clear out a deceased estate. When dealing with a deceased estate, you might be left with a house or an office space filled with too many things which you have no idea what to do with or how to handle. You may sort through all the stuff and find things of value but chances are, about half of the objects in the house or office would end up being totally useless to you. In cases like this, you would benefit a lot from hiring skip bins to help you out. Disposing of waste – especially when there is a huge amount of them, would be quite a chore to do on your own. Read on to see the different benefits of hiring skip bins to help you get rid of useless junk in a deceased estate. Anyone would jump at a chance to save time, effort and money and now you can too! Rather than having to carry the burden of getting rid of all the rubbish in a deceased estate by yourself, you could instead hire skip bins. This would be an ideal, simple and inexpensive way to dispose of all of the useless items. Since you will pass on the task to professionals, it would mean zero effort from you – from packing up all the rubbish to actually transporting it to the disposal area. This would also mean that you don’t have to hire a separate vehicle to transport all that trash. All you would have to do is wait while the people you hired pack up all the rubbish and take it away from your home. Collecting all the garbage involved in a house or office cleanup of a deceased person and having to place everything into those large bins or containers yourself would be quite difficult and dangerous. Having to handle any heavy appliances, damaged items or even broken glass would be a great possibility as these items can all be part of the waste. In hiring skip bins, you won’t have to do any of these. They know how to properly manage trash and they also know how to handle your rubbish so that you are left with a clean home or office. An important thing that skip hire companies do is they manage your rubbish responsibly. From when they collect it from your home to how they handle the rubbish after they collect it, they know exactly what they are doing. The correct disposal and treatment of the waste contribute in keeping the environment cleaner and safer. When dealing with everything inside a deceased person’s home or office, you’d want to make sure that after everything is cleared out, the space remains functional and safe to use or live in. Professional services would do a better job at ensuring this rather than if you do it yourself. Skip bins come in different sizes, based on how much you plan to dispose of. This means that you can hire them for any kind of clearing – whether a smaller office clearing or a bigger house clearing. All you need to do is either inquire over the phone or check out the websites of skip bin companies and you can choose the size you need. So now that you know the benefits of hiring skip bins, you can start deciding which skip bins would you choose to clear your deceased estate. You have to take a good look at what you need to clear out so you can start estimating the size of skip bin to use. To be more efficient, you should go with a bin which is one size bigger that what you had estimated. A reason for this is that in the process of clearing, you’d find out that you might have more rubbish than what you had originally estimated. Therefore if you take a bin which is a size bigger, then you won’t have to deal with that problem. This would involve an office space or a smaller sized home. Clearing out items from these spaces would require a skip bin with a 9-12.5 cubic meters size. In the cases of clearing out bigger houses or properties completely, you would at least need one or two 12.5 cubic meter skip bins in order to remove all of the rubbish in the spaces. 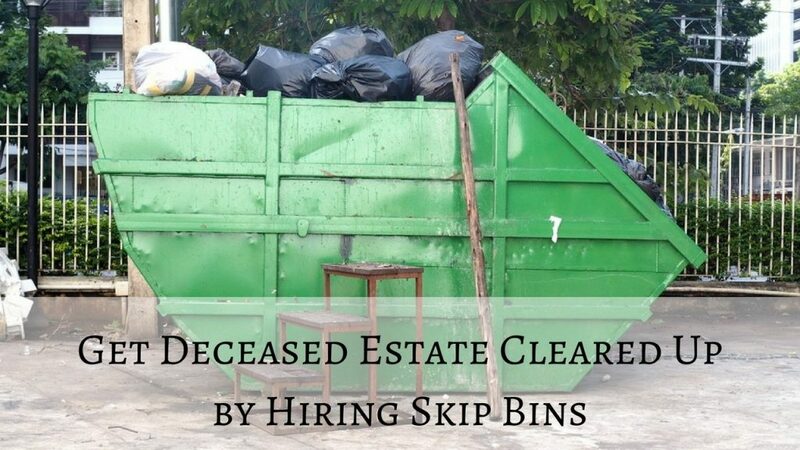 Hiring skip bins would be the most efficient choice for you to clear up all that you need to in a deceased estate. Don’t allow yourself to get stuck with the chore of having to clean everything up, instead choose the easier, more cost-effective way to finish the task of clearing up. Then you can place more focus on working on other things which need to be dealt with in a deceased estate.